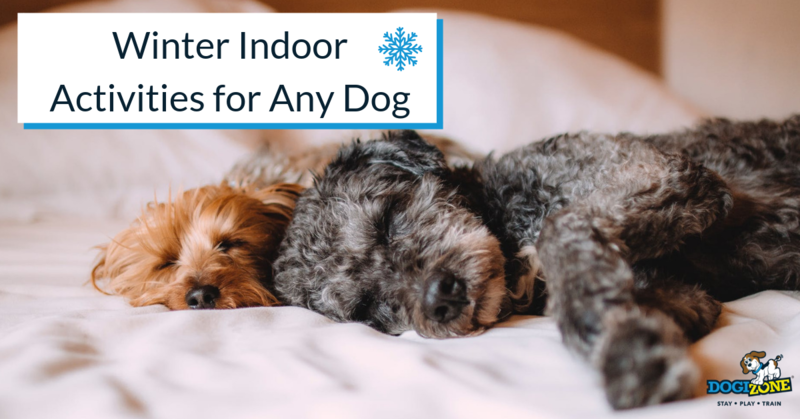 When winter snow or rain is an issue, getting outside and spending time in exercising and playing with your pooch can be a very real problem. It is important to realize that bad weather doesn’t mean your dog will be content just sitting inside a nice, warm and dry home. Dogs that don’t get regular exercise over the winter are more likely to have problems with destructive behaviors, such as chewing, or simply behaviors that are driven by an abundance of energy, such as problem barking. To avoid these issues and to help maintain your dog’s health and well-being on a physical and mental level, there are some simple, easy and low-cost option to find ways to exercise and keep active indoors. If you have a basement or a spare room in the home, think about setting up a mini-agility course. This is easier with small to medium sized dogs, but it allows you to incorporate low jumps, pole weaves, tables and even teeter-totters that are all customized to your dog’s size and weight. These obstacles can be easily made out of PVC pipe and can be a whole family project. This is always a great way to work in some mental stimulation by changing up the routine and adding some obedience work as part of the course. You can really get creative and make your own tunnels out of blankets over chairs and use traffic cones or paper towel rolls glued to a heavy cardboard base for the weaving poles. Click here for additional fun tips from the American Kennel Club! A fun game to play in the house is hide and seek where the dog is “it.” Try having a person work with the dog for a few games until your pooch gets the hang of finding people that are hiding. If you don’t have another person to play, consider hiding small treats or some favorite toys around the house. Use the command “find” or “seek” and you will quickly have a dog that can do something really amazing. There are some great soft types of balls for any size of dog that are ideal to toss around in the house. A long hallway makes a perfect place to throw the ball and have the dog bring it back. It is also a good time to teach your dog to catch. Use a small, soft ball that is easy for your dog to catch, but not too small as to be swallowed. Look for things to do in and around the house that are going to keep your dog mentally exercised as well. Some dog puzzles where he or she has to find the hidden treat or learning a new trick is also an important part of beating the winter blues. Last but not least, you’re always welcome at DogiZone when you can’t find anything to do with your dog on these snowy days. This entry was posted in Agility Dogs, At Home Dog Training. Bookmark the permalink.